WILHELM FALLER was originally a native of the small village of Schönwald in the beautiful Black Forest region of southwestern Germany close to the French border. With its distinctive half-timbered farmhouses, quaint red-roofed towns, vast dark evergreen forests, mountain peaks, lakes, rivers and lush valleys, the Black Forest even then was a popular destination for holidaymakers and visitors. The village was within striking distance of the old cities of Freiburg (Germany), Strasbourg (France) and Zurich (Switzerland). The Black Forest was also the home of the world-famous cuckoo clock – the first such device was actually claimed to have been invented in a Schönwald workshop as far back as 1737. The area became renowned for the quality of its craftsmanship and the little wooden clocks became popular not only in Germany but across continental Europe. By the time Wilhelm Faller was born in Schönwald in 1860, clock making was to the Black Forest economy what shirt-making was to the city of Derry at that time. His father like so many around him was a clockmaker and encouraged his sons in the same trade. In 1873 Wilhelm followed family tradition undertaking a three-year apprenticeship in clock-making in a local clock factory. Once completed Wilhelm looked for work and decided to follow his elder brother Stephen in finding opportunities overseas. 16 year-old Wilhelm left Schönwald for Ireland in 1876 to join Stephen in Athlone. His father gave him a 22ct gold 10 Mark coin as an emergency fund should problems arise. The coin still remains within the family. William spent two years selling his fair share of clocks since around the West of Ireland. By this time Stephen opened his first shop near the docks in Galway city in 1879, his younger brother Wilhelm had already relocated 170 miles north to the bustling city of Derry the previous year. During the nineteenth century, Derry city’s population quadrupled. People moved into the town after the terrible famine in the countryside, the shirt factories provided a degree of prosperity and Derry moved up from being the twelfth largest town in Ireland to being the fourth. 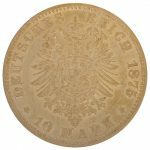 It was a time of great development in the city and 18-year-old Wilhelm had spotted the opportunity to establish his own venture. Traveling the length and breadth of Donegal and Derry with a backpack of ‘wag on the wall’ clocks, cuckoo clocks and other wooded timepieces from Germany this soon proved successful. In 1883, 23-year-old Wilhelm made two major decisions – he anglicised his name from ‘Wilhelm’ to ‘William’ and he opened his first shop in Derry city centre at 25 Ferryquay Street. [Photo courtesy of the Bigger and McDonald Collection]. William’s notes on the wording for an advert for his new shop along with some of the resulting advertisements. 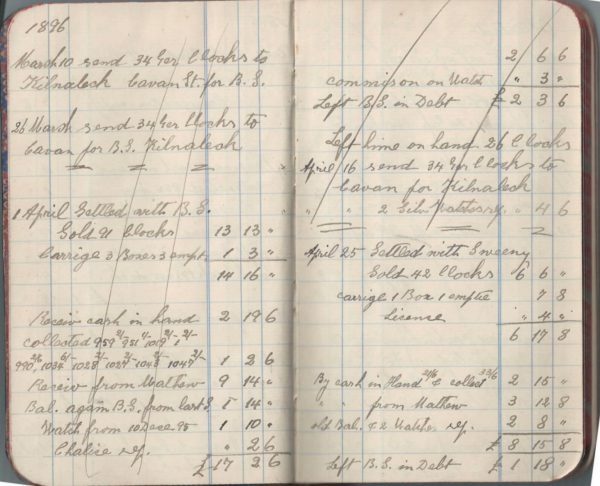 He also continued to sell his clocks throughout counties Donegal and Derry – using the rail network to increase his range far from Derry city and, by 1897, he had six agents on the road selling Faller clocks. 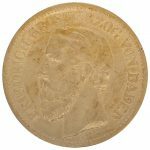 Twenty-one years had passed since William Faller set foot in Ireland but as the turn of the century approached, he had already made his mark as a hard-working and shrewd businessman. William and his six agents. Maria-Anna holding David & William holding Marian, Christmas 1895 photo taken in Kerr’s Studio, Carlisle Road. He’d also found time to marry – on June 23, 1893, William married Maria Anna Loeffler at the Long Tower Church in Derry. Maria Anna was herself German (and like William, from the territory of Baden) and the daughter of a clockmaker, Matthew Loeffler. By 1901 William and Maria Anna had five children ranging in age from seven to one year. They were living at 11 Orchard Street,in the city centre (now part of Foyleside Shopping Centre). 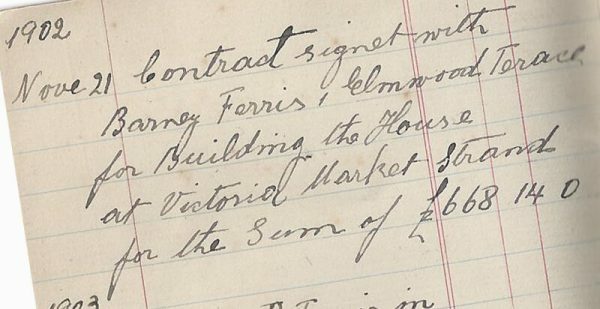 In 1902 William took a ground lease on land overlooking the River Foyle which was newly available for development, (right beside the entrance of the new Victoria Street cattle market built in 1903. The architect Edward Toye was commissioned for the job. He was also responsible for St Columb’s College, the spire of St Eugene’s Cathedral, St Patrick’s Church at Pennyburn and The Playhouse theatre in Artillery Street. The outcome was a magnificent example of an elegant high-class Victorian jeweller, complete with high ceilings to allow natural light. A carpenter from Moville spent five months carving magnificent polished mahogany counters. Templeton’s of Glasgow supplied the cabinets. Wonderfully ornate plasterwork defined the ceilings and in a nostalgic nod to his origins in the Black Forest William obtained a reverse hand-painted mirror depicting the spectacular waterfall in the village of Schonach, four miles from Schönwald. (Many of these original fittings are still in use today). William had little change out of £1,000 by the time all fittings were completed but it was a good move and the business continued to prosper. 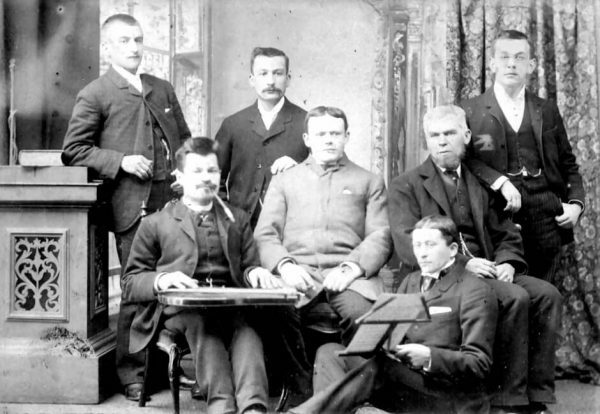 Templetons supplied another cabinet the following year. DERRY was buzzing in the summer of 1914. The Strand Road was one of the city’s main shopping districts – retail heaven stretched as far as the eye could see. Pedestrians crowded the footpaths on either side of the cobbled street as trams, delivery vans and jaunting cars traversed in both directions. Carts, variously laden with oats, potatoes, turnips, turf, and even bogwood, came and went through the arch of Victoria Market – next door to the impressive Victorian facade of Faller’s Jewellers. For the Faller clan at Orchard Street, life was good. The business had continued to flourish and William and Marianna now had nine mouths to feed: Marianna, David, Elizabeth, William, Emily Francis, Louisa, Theresa, Josephine, and Stephen. A daughter, Monica, was born in April 1915. 16-year-old David had already followed his father into the jewellery business and was working as a watchmaker and repairer. A relative from Germany, Mathew Faller, was also boarding with the Faller’s at Orchard Street and working in the shop as a clockmaker and repairer. But under the veneer of normality, trouble was brewing on the streets of Derry and throughout Ireland. The specter of civil war loomed large over everyday life – an all-out conflict between those in favour of Home Rule and those against. Both the Ulster Volunteer Force and the Irish Volunteers were active in Derry and across the county line in Inishowen. But much worse was looming in Europe. As events rapidly unfolded on the continent, it came as a huge shock to people in Derry and Donegal – utterly distracted by the threat of civil war – that a world war had materialised on the horizon. “A great European outbreak feared,” noted the Derry Journal of July 31, “A situation of unparalleled gravity.” It certainly was and must have caused William Faller and his German-born relatives in Ireland considerable trepidation. Four years of unprecedented war in Europe that would cost the lives of ten million people – including well over a thousand participants from Derry. The economically depressed years following the First World War were extremely difficult. Particularly with the volatile political situation between those for and against Home Rule in Ireland, the atmosphere was rife with tension. In June 1920, rioting and street fighting had broken out in the city of Derry. The Partition of Ireland took place on 3 May 1921, creating a border between Derry and Donegal and William definitely felt its impact on their families’ livelihood. The new border caused the demise of the clock wholesale business in Donegal and being Catholic in the primarily protestant Northern Ireland it was very precarious times. 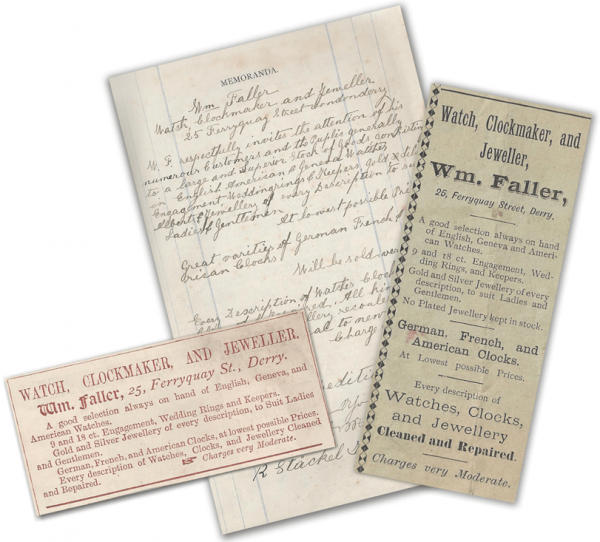 Stephen Faller (William’s youngest son) joined the family business in 1923 at the age of 15 and like his brother David, learned watch, clock, and jewellery making and repairing. In 1931 he also qualified as an optician and he set up his practice in the middle floor of the Faller building, still continuing in watch repairs and working in the shop as needed. His sister Therese qualified as a dentist in 1937 and she also ran her practice in the 2nd-floor adjacent to the optician’s room. 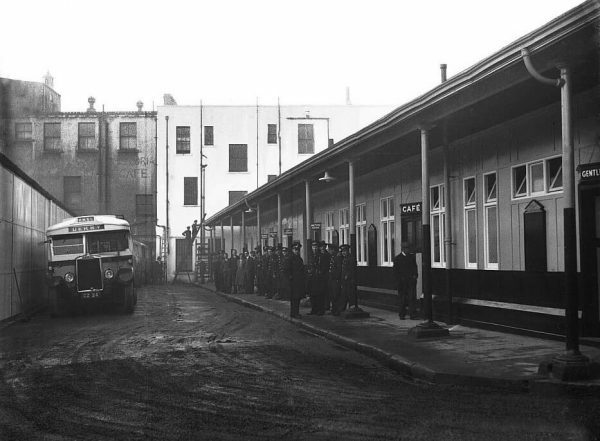 Army personnel waiting at Victoria Market Bus Depot directly behind Fallers – C1940’s [Photo courtesy of the Bigger and McDonald Collection]. With the onset of World War 2 in September 1939, Derry became not only the largest convoy base in the British Isles but also the main American communications base in Europe. As such Derry was considered a particularly attractive target. The blackout procedure had to be strictly observed. No streetlights burned, no familiar signs or clock faces were visible. In every home, the light burning within had to be concealed. Rationing was another wartime necessity for the civilian population. Everyone was issued with a monthly ration book containing coupons. William managed to avoid internment, even though he was still a German subject. An RUC officer came from Victoria Barracks, nearby William’s shop, apologised and said he had to intern him unless he became a British subject. William refused stating that he did not feel signing a piece of paper would change him. The Catholic bishop of Derry, interceded on Willam’s behalf and RUC sergeant dropped the demand giving Willam’s age as his reason. The anti-german feeling did impact on the business which struggled on through some very hard years. After the death of their father, Stephen and his brother David worked together for 6 years. Business continued to be challenging due to post-war shortages and David left to work in Dublin. Stephen was kept busy between his opticians’ practice, watch repairs and running the shop, working long hours to fit in all his commitments. He still found time to court Maeve Kelly from Drogheda, Co. Louth. She worked as a nurse in Dublin and he took the train to visit her. After a whirlwind romance, they married in 1947. They lived above the shop. Their 1st child Desmond, (who unfortunately passed away from TB aged 3 years old in 1951,) was followed by Stephen and Dorothy. As consumer goods became more readily available business improved. More financially secure Stephen was able to buy a home for his family in Clarence Avenue, moving there in 1952. His youngest children, the twins Noel and Dermott were born there. His wife Maeve joined the business full-time in 1961 and her presence in the shop still continued well into her nineties. Stephen’s youngest son Noel started helping out in the shop in 1965, initially Saturdays and school holidays, developing skills in jewellery manufacture and repair. While the rest of Stephen’s children went on to other careers Noel’s interest in the family business remained and he joined the business full-time in 1971. In 1969, fierce riots broke out once more in the city of Derry, the resulting conflict, known as the “Troubles”, would last until 1998. Faller’s shop was lucky to survive this turbulent period with only minor damage, (one cracked 2nd-floor window). Grills were placed on the upper story windows of Fallers to reduce damage by thrown bricks or petrol bombs. Noel studied at the Gemmological Institute of Germany and also the Gemmological Institute of America in Caifornia. In 1982 he qualified in Gemmology and a year later he became a diamond member of the Gemmological Association. His excellent skills and knowledge in diamond sourcing and grading is reflected in the quality and range of diamond jewellery produced by Faller today. In 1983 (our Centenary year) the archway next door, previously the entrance to the Victoria Market, was purchased and the shop increased in size. Care was taken to compliment the Victorian features of the original shop. The mantlepiece, ornate painted mirror and original cabinets and counters were moved into the new space. The ornate plasterwork ceiling was copied in the new addition. The old fireplace and chimney breast were removed creating internal access to the new area. New glass and brass counters were purchased to take advantage of the increased floor space. In 1988 the workshop was extended to the top floor where Hugh Stewart continued to work until he retired in 1992. As time went on, Noel played an increasing role in how the shop was run, building on his knowledge and experience. With his father’s encouragement, Noel initiated his ideas to encourage business growth. New goldsmiths were employed and the workshop was also expanded and developed, increasing its production capabilities. Our current designer and goldsmith Una Carlin joined in 1996. Faller’s first website was launched in 1998. Stephen Faller remained the proprietor of Faller until he passed in 1999 at the age of 91. His son Noel, taking charge after this sad loss, continued to develop his vision for the future of Faller. While still keeping the core values of quality, value, and service, he wanted to increase the individuality and choice available to our clientele by increasing the range of jewellery exclusively designed and made by Faller. As interest in platinum jewellery increased new skills and machinery were introduced to achieve the quality we expect of our Faller product. In September 1999 Noel, along with the Steensons of Glenarm, County Antrim purchased the first laser welders in Ireland. Giving the workshop the ability to seamlessly weld platinum and gold. The shop has also evolved. Understated elegance, contemporary taste, and modern technology have been perfectly blended with the distinctive original features of this listed building. Traditional values combined with innovative style being the trademark of Faller. In 2006 our second website was launched. Faller began with timepieces but over the years that emphasis has changed. In 2007 the decision was made to phase out watch retailing completely to increase our focus on jewellery designed and made by Faller. Four new goldsmiths (Irish and German) joined Faller between 2000 – 2006. In 2003 Una trained in CAD (computer-aided design) and designed new jewellery ranges which were produced in our workshop. In 2005 the addition of a German Benzinger wedding ring lathe and a Swiss Posalux lathe give the workshop the ability to profile and pattern grooved lines on wedding rings using diamond tools. In 2007 a deep laser marker was installed, again a first for a jewellery manufacturer in Ireland. This allowed us to personalise and pattern rings and other jewellery. In 2009 Faller launched part of our Heritage range – High Crosses of Inishowen and the Oakleaf Brooch. Installing a vacuum enclosed casting system in 2011 allowed is to bring all our casting of platinum, gold, and silver in-house. Early in the morning of the 20th of January 2013, Edward Meenan and his team installed the “Golden Teapot” on the façade of Faller the Jeweller at 12 Strand Road. This marked the 130th year since the first Faller shop was opened in Derry city. The huge gold-leafed ornamental teapot trade sign originally hung in Waterloo Place from 1866. Noel Faller bought it from Mrs Jean McCullagh in 1974 after the Teapot was taken down from permanent display in the 1970’s. The teapot was kept safely in storage throughout the turbulent era of the troubles. Madonna, one of our goldsmiths who joined Faller as an apprentice in 2005 aged 17, underwent training by Master Stone-setters in Germany and Holland. She has since become a highly skilled stone-setter. From 2013 on, all stone setting has been carried out in our workshop. While we have been using CAD since 2003, CAM (computer aided manufacture) was still out-sourced. In 2017 a 3-D printer was installed, finally allowing us to be become fully vertically integrated, from design to final product, with all production processes in-house. By July 2017 over 90% of Faller product by value is designed and crafted in our workshop above the shop. 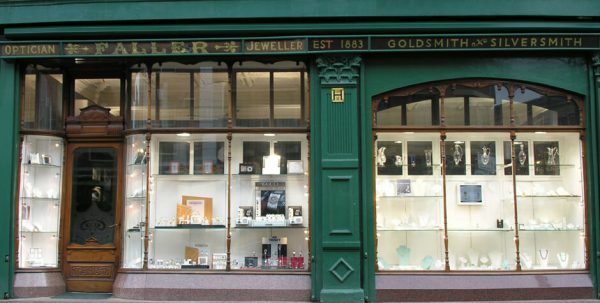 Today four comprehensively trained goldsmiths are employed in the Faller workshop which occupies both upper floors above the shop. It continues to be constantly updated as new advances in the field of jewellery manufacture are developed. While traditional handcrafting skills remain the core of production, CAD, CAM and laser technology also have their part to play.